Prepare a 8-inch or 9-inch square baking pan with a piece of parchment paper with overhangs on each side. Toss oats with coconut oil to coat. Spread onto a parchment paper or silicone mat lined baking sheet. Bake in a preheated 300-degree oven for 10 to 12 minutes. Stir after about 5 minutes. Set aside and let cool. In a small saucepan, bring honey to a boil over medium-high heat. Boil for 1 minute. While honey boils, stir cooled oats and rice cereal together in a large bowl. Remove honey from heat and immediately stir peanut butter into the honey. Then immediately pour over oats and cereal. Mix for 30 seconds and then add chopped Snickers. Mix for another minute or until well incorporated. Immediately spread into the square baking pan. Press down to make even. Refrigerate for one hour and then remove from the pan onto a cutting board. With a knife or your hands, break into large chunks. To make a parfait, layer crumble, yogurt, and fruit. I prefer to heat up my frozen fruit a little to thaw it and I love how the juices seep into the yogurt. But fresh fruit is also a great option! 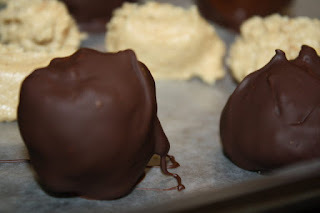 Last month's Chocolate-Covered Treat food fight winner is Chocolate Dipped Peanut Butter Balls from Our Eating Habits. Because who doesn't love THAT combo? !